Every one of us wants to be loved and helped by the people around us. Each one of us loves to have good feelings about ourselves in other's mind. We would love to grab other's admiration and affection. We feel our life would have been much happier and merrier if the people around us have known us. And the gospel truth is nobody wants to be ignored and feel detached from the society because we feel that we have at least something to contribute for the betterment of everything as said by John Donne, "No man is an island, entire of itself; every man is a piece of the continent." Going through this awe-inspiring and awe-stricken book, "How To Win Friends And Influence People" by Dale Carnegie, it has really enriched me with the formulae and the equations of life in making people to love you and like you. This is awesome. Hallowed. Admirable. And favourable. Though there are many breathtaking and arresting things mentioned in this book, I am truly coloured by his 'Six Rules To Make People Like You,' in which he deliciously mentions the basic life rules to drag people in our own magnetic field. 3. Remember that a man's name is to him the sweetest and most important sound in any language. 5. Talk in terms of the other man's interest. 1. BECOME GENUINELY INTERESTED IN OTHERS. 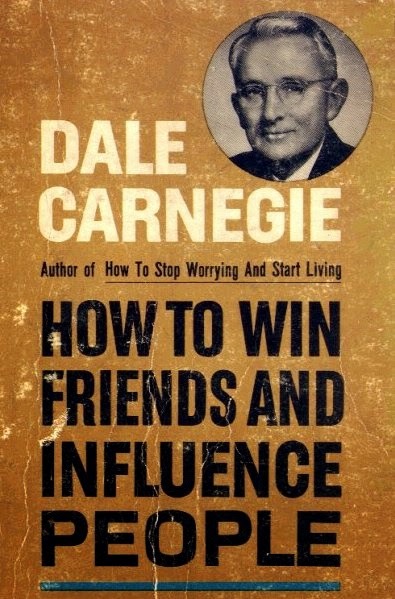 BOOK : Carnegie beautifully puts in, "You can make more friends in two months by becoming interested in other people than you can in two years by trying to get other people interested in you." The late Alfred Adler, the famous Viennese psychologist, wrote a book entitled What Life Should Mean to You.In that book says: "It is the individual who is not interested in his fellow men who has the greatest difficulties in life and provides the greatest injury to others. It is from among such individuals that all human failures spring." One of the secrets of Theodore Roosevelt's astonishing popularity was due to his intense interest in people. His honest liking for humble people was shown by the fact that he greeted all the old White House servants by name, even the scullery maids. LOOK : This can be just like a law; to receive you must first give. Everybody is interested in one's life only and nobody is interested in other's life. And this is the main reason why we constantly dissolve into exhaustion whenever we try to grab other's attention without first, giving our attention. If you give your friend a photo of your group friends, you will notice him first searching and eyeing at his own photo and this is same to all of us, even I do and all of us do. So the best technique to grab other's attention is to genuinely become interested in them. BOOK : Action speaks louder than words, and smile says, "I like you. You make me happy. I am glad to see you." You don't feel like smiling? Then what? Two things. First, force yourself to smile. If you are alone, force yourself to whistle or hum a tune or sing. Act as if you were already happy, and that will tend to make you happy. Everybody in the world is seeking happiness - and there is one sure way to find it. That is by controlling your thoughts. Happiness doesn't depend on outward conditions. It depends on inner conditions. The Value of a Smile at Christmas are; it costs nothing, but creates much. It enriches those who receive, without impoverishing those who give. It happens in a flash and the memory of it sometimes last forever. None are so rich they can get along without it, and none so poor but are richer for its benefits. It creates happiness in the home, fosters good will in a business, and is the countersign of friends. It is rest to the weary, daylight to the discouraged, sunshine to the sad, and Nature's best antidotes for trouble. Yet it cannot be bought, begged, borrowed, or stolen, for it is something that is no earthly good to anybody till it is given away! LOOK : As quoth by Marcus Aurelius, "The happiness of your life depends upon the quality of your thoughts," our happiness has nothing to do with the outer condition. Think positive thoughts and automatically happiness will be your ever follower. The favourable way to enjoy an abiding and unwavering happiness is to smile everyday, everywhere in many times because, "A smile is a curve that sets everything straight," as said by Phyllis Diller. My little eternal smile has helped me in getting through rough and tough times because it has been teaching me to accept the things in much challenging and splendid ways. My life has always been beautiful and wonderful in its presence and I am always thankful to my little smile that yields big in me. That's why I have promised to live up to my philosophy 'SSS ; Simplicity, Silence ans Smile.' I always love F. Scott Fitzgerald words, "It was only a sunny smile, and little it cost in the giving, but like morning light it scattered the night and made the day worth living." I love smiling and hope you don't miss my smile because every time you visit my blog you will observe my smiling face(favicon). 3.REMEMBER THAT A MAN'S NAME IS TO HIM THE SWEETEST AND MOST IMPORTANT SOUND IN ANY LANGUAGE. BOOK : Most people don't remember names for the simple reason that they don't take the time and energy necessary to concentrate and repeat and fix names indelibly in their minds. They make excuses for themselves; they are too busy. But they are probably no busier than Franklin D. Roosevelt, and he took time to remember and recall even the names of mechanics with whom he came in contact. To illustrate: The Chrysler organization built a special car for Mr. Roosevelt. W. F. Chamberlain and a mechanic delivered it to the White House. I have in front of me a letter from Mr. Chamberlain relating his experiences. "I taught President Roosevelt how to handle a car with a lot of unusual gadgets; but he taught me a lot about the fine art of handling people." Franklin D. Roosevelt knew that one the simplest, most obvious, and most important ways of gaining good will is by remembering names and making people feel important - yet how many of us do it? LOOK : Though I didn't have the habit of remembering the names of the people in the past, this rule has taught me a lot in making others feel important, finally making ourselves feel important. It was very recently that I have been using this rule in my life and the result is awesome and winsome. I had noticed this difference in their reactions: last time one of my friends asked me if I know his name, since we used to meet regularly, without waiting I told his name and you know, he was so happy that he shook my hand with the words; thank you so much. The next day, I met with one of the irregular boy and when I told him sorry for his name, he became dull and dreary and I felt guilty of myself. That much power the remembrance of other's names have. Henceforth, I have been always trying my best to remember their names and call them by their names for I always want to feel myself important. 4 BE A GOOD LISTENER. ENCOURAGE OTHERS TO TALK ABOUT THEMSELVES. BOOK : The man who talks only of himself, thinks only of himself. And "the man who thinks only of himself," says Dr. Nicholas Murray Butler, president of Columbia University, "is hopelessly uneducated." "He is not educated," says Dr. Butler, "no matter how instructed he may be." So if you aspire to be a good conversationalist, be an attentive listener. As Mrs. Charles Northam Lee puts it: "To be interesting, be interested." Ask questions that the other man will enjoy answering. Encourage him to talk about himself and his accomplishments. Remember that the man you are talking to is a hundred times more interested in himself and his wants and his problems then he is in you and your problems. His toothache means more to him than a famine in China that kills a million people. A boil on his neck interests him more than forty earthquakes in Africa. Think of that the next time you start a conversation. LOOK : There are two bold-gold fruits those can be harvested and used in our daily living to engineer our life for magnificence by being a good listener. The first one is Carnegie's rule, by being a good listener you are allowing others to talk about themselves through which we can grab their admiration and direct their attention on us, in this way the people around us will like us. The second one is Doug Larson's words: "Wisdom is the reward you get for a lifetime of listening when you'd have preferred to talk." Clear-sighted. Isn't it? This is Albert Einstein's formula of success: "If A is success in life, then A = x + y + z. Work is x, play is y and z is keeping your mouth shut." Brilliantly put. I too am a good listener and don't like talking too much. This reminds me of my bygone days when my parents used to say this repeated words to me: "Don't be silent. At least talk to people you meet or else they will think you are dumb." Since then I have always been trying to speak something to the people I meet but how much I try that much I feel silence always suits me and that's why my philosophy 'SSS.' I live silence because, "the quieter you become, the more you can hear," as quoth by Ram Dass. I am sorry for those who expect me to talk and it doesn't mean that I won't give a reply at all, I just speak what I have to, nothing more than that. 5. TALK IN TERMS OF OTHER MAN'S INTEREST. BOOK : Everyone who visited Theodore Roosevelt at Oyster Bay was astonished at the range and diversity of his knowledge. "Whether it was a cowboy or a Rough Rider, a New York politician or a diplomat," wrote Gamaliel Bradford, "Roosevelt knew what to say to him." And how was it done? The answer was simple. Whenever Roosevelt expected a visitor, he sat up late the night before reading up on the subject in which he knew his guest was particularly interested. For Roosevelt knew, as all leaders know, that the royal road to a man's heart is to talk to him about the things he treasures most. LOOK : Let me browse those gone days of mine and study it if I had ever been the follower of this rule unknowingly. No. Yes. Hmm, how about the jokes that I have been cracking to my beloved and naughty friends that brought eternal smiles on them and killed their boredom. I am sure that this too also comes under this rule as it is also the one that interests them. One thing about me is I love to see someone smiling and giggling through my joke that I heartily welcome. Otherwise, my time will be wasted in Charlie Chaplin's words: "A day without laughter is a day wasted." Singing and dancing also come under this rule through which we can display in terms of other's interest. This reminds me of my school days where most of the students used to love the one who could sing and dance well. Being a poor entertainer in terms of singing and dancing other students would rarely know me but I am happy that my jokes used to attract other's attention. It is very difficult to be popular unless we do something that interests the people. I will share you about my best friend Ngawang Jampel who used to be the best entertainer in every field. He used to crack jokes , dance facetiously, sing humorously, act comically and cook up the stories intelligently. He used to imitate every teacher and friends too that used to bring laughter in us. That's the main reason why the whole school used to know him and like him. To attract people towards us first we must do thing thing that they are interested in and automatically the things will be done. BOOK : There is one all-important law of human conduct. If we obey that law, we shall almost never get into trouble. In fact, that law, if obeyed, will bring us countless friends and constant happiness. But the very instant we break that law, we shall get into endless trouble. The law is this: Always make the other person feel important. Professor John Dewey, as we have already noted, says that the desire to be important is the deepest urge in human nature; and Professor William James says: "The deepest principle in human nature is the craving to be appreciated." As I have been already pointed out, it is the urge that differentiates us from the animals. It is the urge that has been responsible for civilization itself. Philosophers have been speculating on the rules of human relationship for thousands of years and out of all the speculation, there has evolved only one important percept. It is not new. It is as old as history. Zoroaster taught it to his fire-worshipers in Persia three thousand years ago. Confucius preached it in China twenty-four centuries ago. Lao-tse, the founder of Taoism, taught it to his disciples in the Valley of the Han. Buddha preached it on the banks of the Holy Ganges five hundred years before Christ. The sacred books of Hinduism taught it a thousand years before that. Jesus taught it among the stony hills of Judea nineteen centuries ago. Jesus summed it up in one thought - probably the most important rule in the world: "Do unto others as you would have others do unto you." You want the approval of those with whom you comes in contact. You want recognition of your true worth. You want a feeling that you are important in your little world. You don't want to listen to cheap, insincere flattery but you do crave sincere appreciation. You want your friends and associates to be, as Charles Schwab puts it, "hearty in their appreciation and lavish in their praise." All of us want that. So let's obey the Golden Rule, and give unto others what we would have others give unto us. How? When? Where? The answer is: all the time, everywhere. LOOK : Invariably keep this invaluable Golden Rule in mind: Do unto others as you would have others do unto you. I say certainly the book has given toothsome explanation on this rule and I am left with nothing to share apart from this little view, that appreciation and encouragement are the two lifeblood of making others feel important and I am pretty sure they are the sincerest ways to heighten them to greater heights of greatness. Here is the power of encouragement. Sidney Madwed beautifully puts in: "The finest gift you can give anyone is encouragement. yet, almost no one gets the encouragement they need to grow to their full potential. If everyone received the encouragement they need to grow, the genius is almost everyone would blossom ad the world would produce abundance beyond the wildest dreams. We would have more than one Einstein, Edison, Schweitzer, mother Theresa, Dr. Salk and other minds in a century. I am sure that Dale Carnegie's Six Awesome Rules can bring much happiness in us, can cement our relationships with the surrounding, improve our well-being, help us in achieving our aspirations through inspirations, guide us heavenwards and make us feel homely in our own little world. Besides, they are certainly going to be our guiding principle. They will be the centrepiece and the masterpiece for our constant fulfilling life.